Osco Tank & Tr uck Sales is proud to spotlight custom fire trucks and used fire truck tankers this month. Custom fire trucks are a great addition to any station. Osco builds each truck to fit your specific needs without breaking the bank. With pre-made models, buyers get both options they do and don’t want. Custom-built Osco Tank fire trucks allow buyers to choose exactly what they need and leave out the rest. What kinds of fire trucks do we offer? Osco also offers three different models of fire trucks. First, the Dominator Series lasts and impresses. Next, the Commander Series gets the job done while still keeping the operator in mind. Finally, the Fusion Vacuum Truck, which we highlight in our blog last month. Each model serves a different purpose. Find the model you love and customize it exactly to match your needs. Custom built Dominator Series trucks have Poly tanks and Poly bodies that carry a lifetime warranty. Create the fire tanker that’s exactly right for your needs. Osco builds each Dominator in an elliptical (oval) shape or in a rectangular “wetside” style. Other features of the dominator include a Freightliner, International, Kenworth, Peterbilt, Mack or custom chassis, 1000 to 4000-gallon Poly tanks with a lifetime warranty, and a Poly body with a lifetime warranty. On the truck, there are custom-built storage compartments, Whelen LED emergency lighting, and a 10” dump valve. There are Hale, Darley, or Waterous pumps of 250-1250 GPM, and optional gas-powered auxiliary pumps. These are what’s included on every Dominator truck! The Dominator fire truck is customizable. Portable tank racks, custom built hose trays, a side mounted dump valve, or rear swivel dump fit nicely. Traffic advisors, LED emergency lighting, water cannon(s), and custom electronic water level gauges each add something. Add a center control console, custom sirens and air horns, roll-up doors, or scene lighting. Customize with auto charge systems! See even more options when you start the process. Traditional tank trucks cost an arm and a leg for features you don’t need. The Commander Series includes all the custom options of any Osco truck. However, it comes at a better price and with the operator in mind. 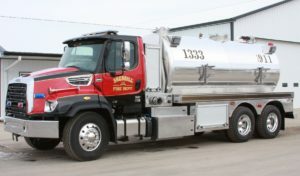 Osco builds each Commander Series fire tanker to perform under all conditions and fits each with either an economical stainless steel tank or a lifetime warranty poly tank. Commander series fire tankers come with a Vent opening, sight gauge, 20″ man way, (3) threaded NPT openings/fittings, back welding (interior seams welded), and mild steel skid. Choose between Osco’s economical stainless steel tanks or our lifetime warranty poly tanks. The Commander series also includes liquid foam tenders that each hold up to 5,000 gallons of liquid firefighting foam. These trucks are easy to dispatch and set up to gravity feed or pump off the foam solution. Commander series fire tankers are customized with Epoxy coating, extra baffling, stainless steel Hose tray, 9″ X 7″ Halogen scene lights, stainless steel SDTR, stainless steel catwalks, 10″ dump valve, stainless steel skid, stainless steel storage compartments, and stainless steel rear step bumper/hose tray. Pump options are also endless. Learn more about them here. Be confident in the knowledge that each goes through a 120 point inspection, road testing, DOT inspection at an independent truck service center. Trucks also receive new paint, tires, brakes, bumper, and powertrain fluids and filters. Interested? 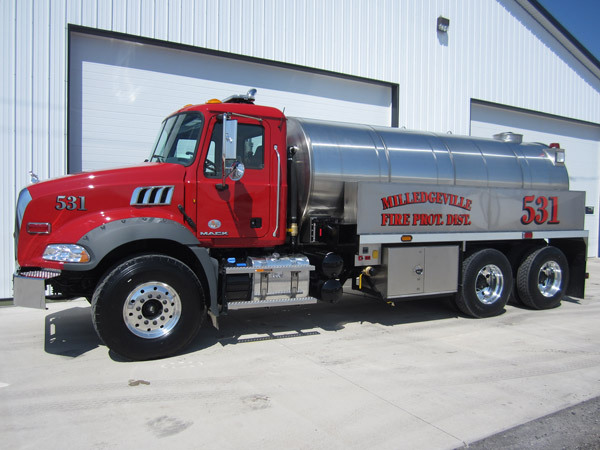 Want to hear about our used fire tankers for sale? Call Osco Tank & Truck Sales a call today and get started customizing your dream fire truck.